When you want stylish and affordable roof shingles for your home, consider fiberglass shingles! One of the most popular types of asphalt shingles, fiberglass shingles provide great protection and come in many styles and colors. Contact your local roofing experts at Airborne Roofing at (856) 662-1382 for fiberglass shingle installation in Berlin and Cherry Hill, NJ. Roof shingles come in many varieties, and often go by many names. Asphalt shingles are the most commonly used roofing material in the country, and there are two main types: fiberglass shingles and organic shingles. There are many similarities between the two; however, the primary difference is that fiberglass shingles are made from a fiberglass mat rather than a paper mat. This means that they are lighter weight, longer lasting, and fire resistant. Our roofers use fiberglass shingles because you get durable protection at a great price! Waterproof and weather-resistant, fiberglass shingles come in nearly endless styles and colors. Do you want a green roof with rounded shingles? Looking for a classic and sophisticated roof in natural colors? We have an option for any home! With regular maintenance, you can expect your new roof to last 15-30 years, based on average shingle roof lifespans. If you need help finding the best roof for your style and budget, let one of our helpful roofers assist you! We are happy to answer any questions you might have. To ensure that you get the best roof, Airborne Roofing is committed to using quality materials and proper techniques. 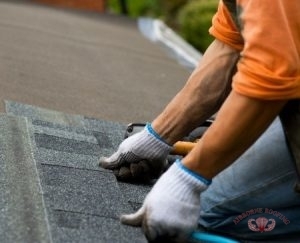 Whether you need shingle repair or replacement, you can count on us to adhere to industry standards. This helps guarantee the durability and integrity of your roofing system. We aren’t the kind of roofers who will cut corners or try to up-sell you on a service you don’t need. Our contractors want to provide top quality roofing services so you and your family can enjoy your home for many years. If you are looking for fiberglass shingles in Berlin and Cherry Hill, NJ, call the team at Airborne Roofing for premier installation and repair services at (856) 662-1382 . Updated on September 21, 2018 at 2:35 pm by Airborne Roofing.